Exfoliating Includes Acids, And Acids Aren’t Scary! We’ve got a lot to say about exfoliators, but, before we get started, we just want to say — the days of harsh exfoliators are long gone. Like we explained in our post about cleansing, the Korean approach to all things skin is to be super gentle, and exfoliating is no different. That might sound contradictory — how can you effectively slough off dead skin cells without being even a little harsh? There are two types of exfoliators — physical and chemical. A physical exfoliator is a textured substance or tool that sloughs away the topmost layer of skin; we’re talking things like sugar scrubs, cleansing towels, peeling gels, amongst others that, well, physically exfoliate. When done properly, physical exfoliators give you immediate results — baby-soft, smooth skin you can feel right away. Physical exfoliators, however, only work on the surface level of skin, and they’re not recommended for sensitive skin types or skin that’s prone to irritation. 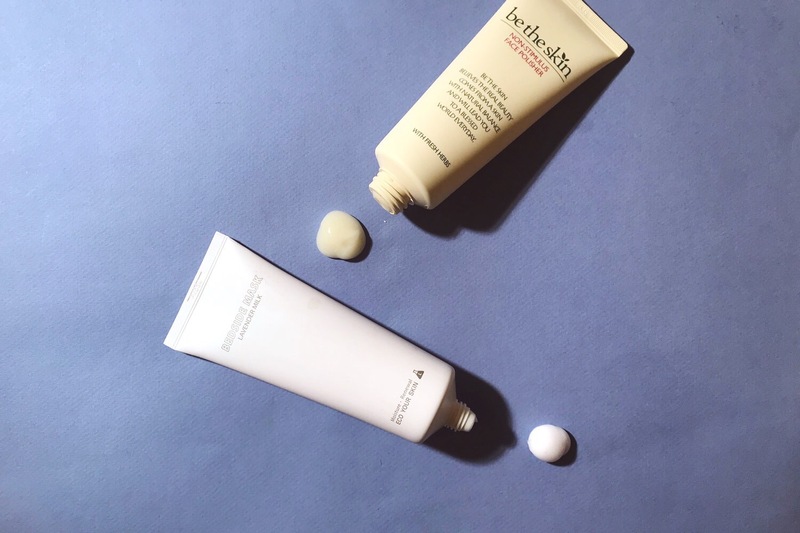 That doesn’t mean you should write off physical exfoliators altogether; there is a time and place for them; and, like pretty much all things skin, the key is to listen to your skin and its needs. You might have a day when your skin is feeling really dull and rough, and it might benefit from a physical exfoliant. You might have oily or acne-prone skin that might regularly want some physical sloughing. The main thing with physical exfoliators is that they don’t need to be hard or abrasive to be effective; in fact, they shouldn’t be. That intense feeling of something really scrubbing away at your face might make you feel like you’re exfoliating more effectively when chances are you’re actually damaging your skin. Avoid exfoliators that include nutshells or fruit pits altogether because they can actually scratch and irritate skin, and resist the urge to rub an exfoliator intensely or deeply against your skin. The very nature of a physical exfoliant being applied to skin will generally be exfoliating enough — and you won’t damage your skin barrier in the process, which is essential to optimal skin health. Remember, gentle is key when it comes to skin! Chemical exfoliators, on the other hand, are made up primarily of acids, and there are three common types: AHAs, BHAs, and PHAs — we’ll explain each very shortly. The word “acid” might be intimidating, but we promise that it doesn’t have to be! To put it simply, a chemical exfoliator helps slough away your dead skin cells and encourage cell turnover in your skin. A chemical exfoliator doesn’t just work on the surface level; it also sinks into the deeper layers of your skin and exfoliates from deep within. You can often use the different kinds of acids together because, as you’ll soon learn, they each work in slightly different ways, and you can look for the type of acid that best suits your skin needs. Chemical exfoliators also often have secondary benefits, helping with brightening skin, evening overall tone, or pulling hydration to skin, and they’re actually safer than most physical exfoliators, which can be too rough for skin. You also don’t need a high concentration of acids for a chemical exfoliant to be effective; in fact, you shouldn’t reach for the strongest concentration because that could actually damage and burn your skin. As always, the guideline stays the same — when it comes to skin, go for gentle. AHAs, BHAs, and PHAs: Here’s the briefest introduction. AHAs are water-soluble, and their most well-known forms are glycolic acid and lactic acid. Naturally found in fruit, milk, and sugarcane, AHAs help loosen the “glue” that keeps dead skin cells attached to skin so they can be washed away and removed from the surface of skin. AHAs also help encourage cell turnover, stimulating the growth of new cells, and, because of their smaller molecular size, AHAs are able to penetrate skin faster and deeper, producing faster visible results. That same smaller molecular size, though, isn’t always the best for sensitive skin. If you have sensitive skin, we highly, highly recommend doing a patch test before using an AHA product all over your face. We also recommend starting with a lactic acid because lactic acid has a slightly larger molecular size than glycolic acid, which makes it slightly less irritating. Glycolic acid is considered the most powerful AHA, with a smaller molecular size than lactic acid, which means that glycolic acid penetrates just a little faster and deeper into skin. If you have particularly dry skin, we might also recommend trying lactic acid because it helps lock in moisture. BHAs are oil-soluble, so they’re able to sink deeper into pores (than AHAs can) and draw out oil and all the bacteria and gunk that have been trapped in these oil-clogged pores. The most common BHA used in skincare is salicylic acid, which you’ve probably heard of if you have serious acne-prone skin. Unsurprisingly, BHAs are great for oily or acne-prone skin because of their ability to dissolve oil and excess sebum, making them particularly effective at clearing out pores. BHAs also have anti-inflammatory properties; that also benefits acne-prone skin because one of the main causes of acne is inflammation. The thing that really sets PHAs apart from AHAs or BHAs is their larger molecular size. PHAs work very similarly to AHAs, but their larger molecular size means that PHAs are slower to penetrate skin and actually don’t reach as deep a level in skin as AHAs might. That doesn’t mean PHAs are any less effective or beneficial to skin, though; like AHAs, PHAs exfoliate the surface of skin, helping to smooth skin and improve overall tone — they just do so very gently. Basically, PHAs provide maximum results with minimal irritation, working gently on the surface of skin without causing irritation. They’re recommended for all skin types, including sensitive skin — if you’ve tried AHAs or BHAs and stopped because they caused redness and irritation, you might want to give PHAs a chance. Gluconolactone is a PHA that’s actually naturally occurring in skin, which means skin is less likely to react to it. Also, not only do PHAs exfoliate and resurface, but they also work as humectants, binding moisture to skin. Ease into introducing acids to your routine. If you’re totally new to acids, we recommend starting with a toner — or even a sheet mask! — that contains acids. Acids can be harsh substances to start cold, so we like introducing acids to skin gradually, starting with formulations that contain acids but are not exfoliators. Give your skin the time it needs to adjust, and ease into it. And always, always patch test! We recommend trying the exfoliant on a spot along your jaw first to make sure you skin doesn’t react negatively or become sensitized. It might be annoying when you’re eager to jump into exfoliating, but it’s always better to be safe than sorry. It doesn’t really matter when you exfoliate; just do it regularly. We recommend exfoliating at least two or three times a week to prevent dead skin cells from piling up and to keep skin looking radiant. If you have sensitive, irritated skin, though, we recommend reducing that to maybe one to two times a week. Again, though, that’s not a hard and fast rule — listen to what your skin is telling you it needs. There’s also really no set time of day, whether or morning or evening, you should be exfoliating — that’s really up to you! 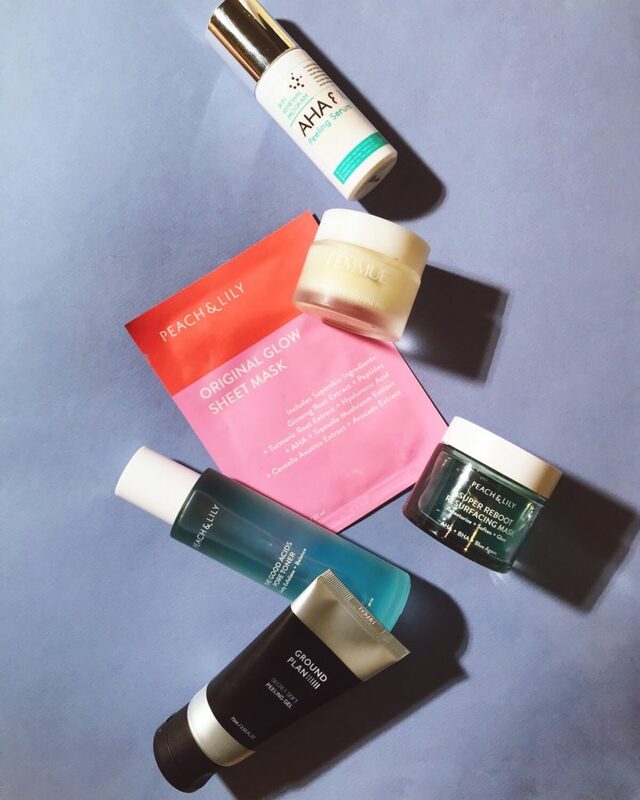 Some of us prefer to do our heavy-duty skincare at night, while some of us prefer to do more treating during the day and more healing overnight. Some of us just don’t have the time to exfoliate in the morning, while others of us don’t want to add yet another step at night. As long as you’re regularly making the time at some point to exfoliate, you should be good! Sunscreen is essential. We repeat: sunscreen is essential. When you use an acid, especially AHAs, you absolutely must remember to apply sunscreen. AHAs make your skin more photosensitive, which means that your skin will be more likely to burn when exposed to UV rays. Don’t do all the hard work of caring for your skin and undo it all by neglecting sunscreen! Finally, here are a few exfoliators we recommend. Exfoliating Products: the Peach & Lily Good Acids Toner contains both glycolic acid (AHA) and salicylic acid (BHA) to provide some exfoliating while it does its primary job as a toner — balancing the pH level in your skin. 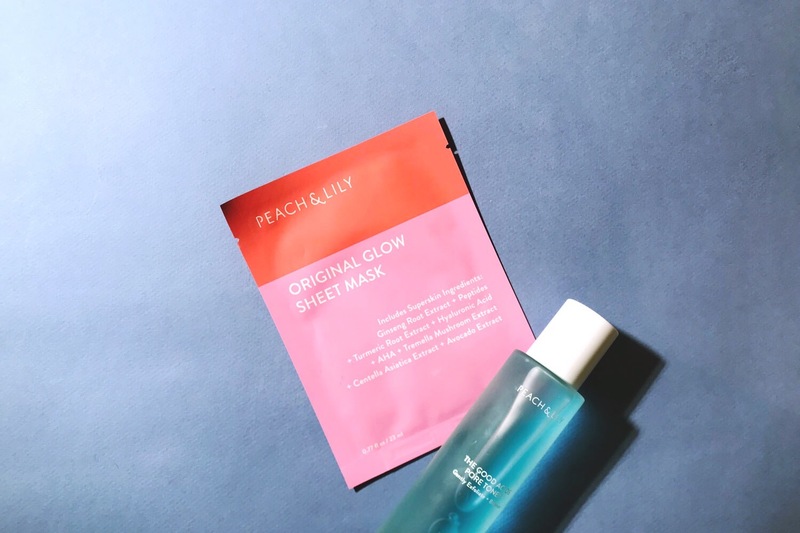 The Peach & Lily Original Glow Sheet Mask contains glycolic acid to provide exfoliation while the mask overall helps nourish, hydrate, and brighten your skin. Both are great, super gentle ways to start introducing acids into your skincare routine. Physical Exfoliators: in case you hadn’t already noticed, we like to keep things super gentle, even when it comes to exfoliators. Femmue’s Flower Infused Fine Peel is packed with hydrating and soothing ingredients like camellia japonica extract, centella asiatica extract, and geranium, while dried camellia leaves provide the gentlest exfoliation. 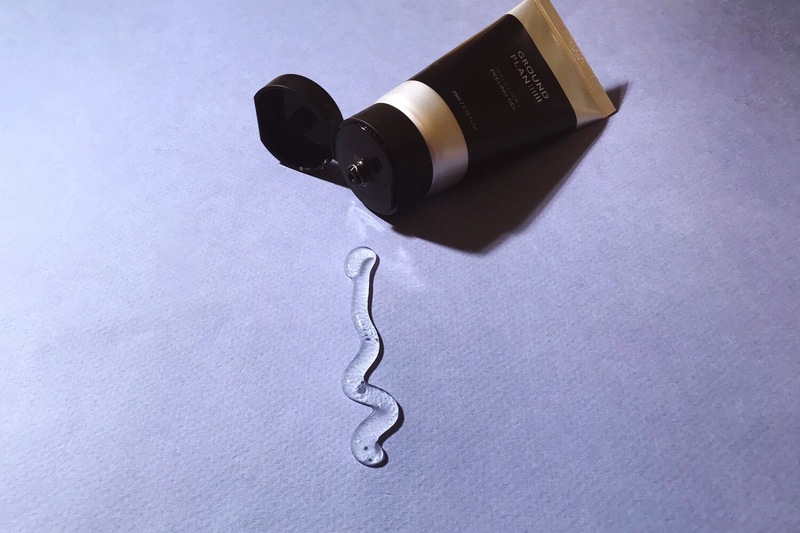 Ground Plan’s Secret Peeling Gel is a truly unique gommage gel that rolls off into little bits as you massage it over your skin, and it helps draw out impurities and oil while deeply hydrating. Be the Skin’s Non-Stimulus Face Polisher squeezes onto your hand as a creamy gel texture that gathers together as you massage it over your skin, creating little clumps of oil and debris, all without harming or damaging your skin. Chemical Exfoliators: the Peach & Lily Super Reboot Resurfacing Mask is a professional-grade mask, which means it contains 10% AHAs and 5% BHAs — the truly awesome thing about this mask, though, is that it contains so many soothing ingredients (hyaluronic acid, centella asiatica extract, chamomile, aloe) that even people with sensitive skin have reported that it’s gentle enough for their skin. Mizon’s AHA 8% Peeling Serum contains, well, 8% glycolic acid to exfoliate dead skin cells and help fade hyperpigmentation gently. Eco Your Skin’s Lavender Bedside Mask is a sleeping pack that contains milk proteins and lactic acid to exfoliate skin while you sleep. Any more questions? Let us know in the comments below!